I am especially happy to be back on Kevin’s blog because I really wanted to finish out my review of the Euro Falle series. In the interim, Jerry Loo has followed up with a nice review of Euro Falle 03 and Jeff has presented a brief sketch of Euro Falle 04. I’ll try not to retread old ground, but it’s probably inevitable. Bear with me on that. By the by, Jerry acquired his 03 the old fashioned way, he exchanged for it! That has to be a lot more fun than filling out a Puzzlemaster checkout form for the 123rd time. And no, I’m not wise enough plan ahead and start an account. Who has time for that? 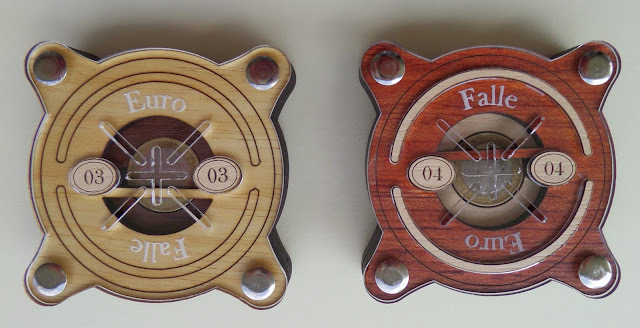 So today I present to you Euro Falle 03 and Euro Falle 04. As you’ve guessed, these are in series after Euro Falle 02, but you will see right away that they are a different beast on a couple of fronts. These puzzles fall into a class that I, as a novice, particularly enjoy. They are puzzles from IPP that have become available on the “open market”. Not all IPP puzzles make it to the masses. But some few do, and when that happens, you should give them very careful consideration. This post aims to help you with that. As for me, I just snapped them up on impulse. That is also a good approach. Like EF 02, EF 03 and 04 were designed by Jürgen Reiche and manufactured by his shop, Siebenstein-Spiele. EF 03 was Alan Stein’s exchange puzzle at IPP 35 in Ottawa this year and EF 04 was entered in the puzzle design competition. Reiche is listed as the designer, but Alan Stein’s name is on the back of the puzzle. Perhaps someone can explain that? Anyhow, although I’m sure it was a formidable competitor, it did not garner any prizes. Check here to see what EF 04 was up against. Alan Stein, if you did not know, is the man behind Puzzle Master. So if you buy a Euro Falle from his store, you can claim to have exchanged for it. Some interesting info on Alan/Puzzle Master roots is over here. The first thing you will notice about the new Euro Falles is that they are quite a bit larger and of different shape than EF 02. They are basically round in plan with four spurs which support the pin and screw system that holds them together - quite a bit different from the football (U.S. style (Ed: That is NOT a football shape it's a rugby ball!)) shaped, two pin EF 02. The body is nearly twice as thick, providing much more internal room, potentially, for mechanism. The color scheme for the two IPP puzzles are different, one with a light brown/tan front and the other in reddish-brown. Both are fashioned from four layers of laser cut wood. 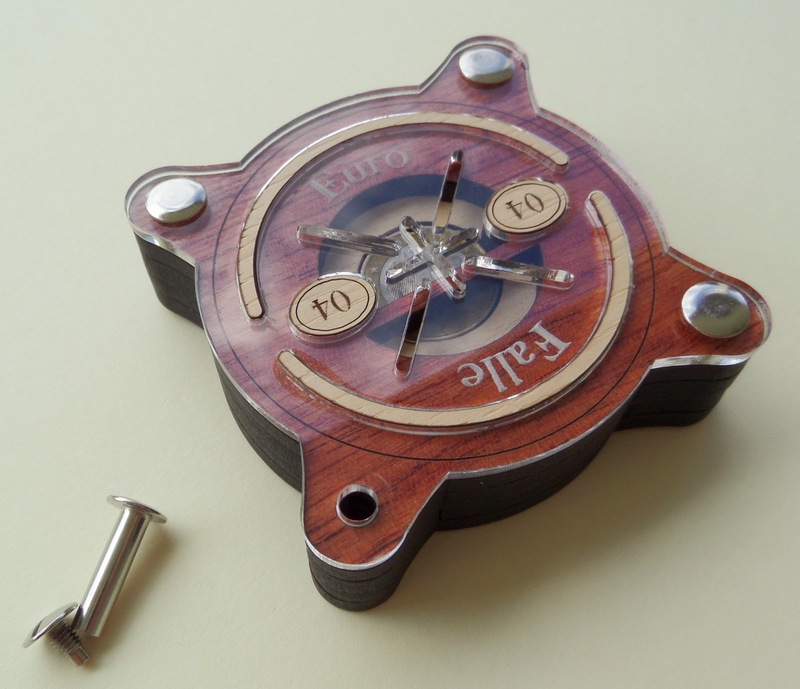 According to the design competition listing, EF 04 is made of Bubinga wood. Not being a collector of fancy boxes or dissections, nor a woodworker, I had to look that up. The internet informs me that it is an exotic, beautiful, and very hard (denser than white oak) wood from equatorial Africa. Probably not necessary for this type of puzzle, but a nice touch nonetheless. I suspect that only the top layer is Bubinga. 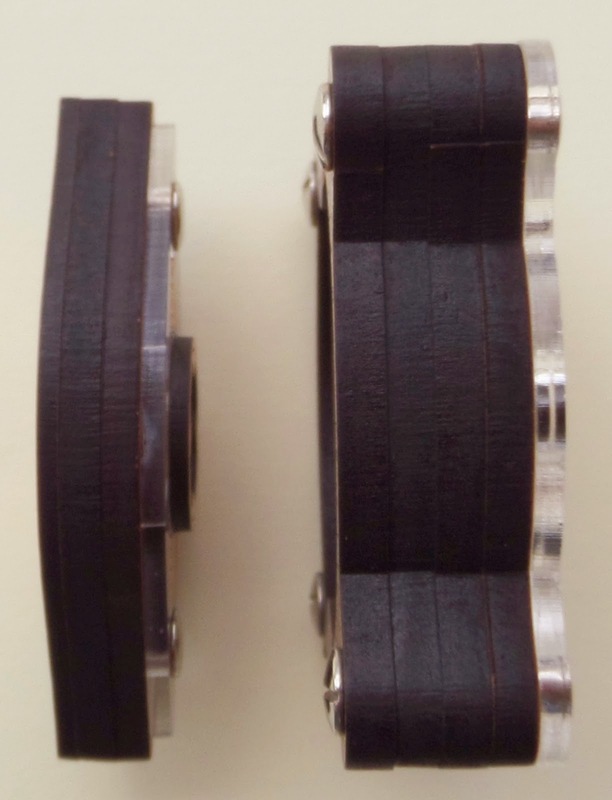 The EF 04 has a slightly more complex two-tone inlay on its front side compared with the EF 03. Both puzzles sport an acrylic (well, plastic of some kind anyway) ‘cover’ on the front. This lets you see, but not touch, your Euro. Normally these acrylics make me a little nervous, as I’ve found that they can scuff up pretty easily with casual handling and play. For this reason alone, I do not intend to pass these two around as carelessly as I would the EF 02. One saving grace regarding the cover is that the pins holding the puzzles together stand out slightly from the front and back. This provides a measure of protection in case your prized Euro Falle is slid back across the table to you like a hockey puck by, say, your offspring who have no interest in puzzles. Aside from my acrylic quibble, these puzzles are true to Euro Falle form. They are very solid and have nice heft. Minor scuffing is to be expected, but they are not going to break any time soon. As Jerry has demonstrated, they are travel-worthy. Level of craftsmanship is high, as you would expect. EF 04 does show some over-bleed of glue around the inlays. Less is more when it comes to glue. But you can only see this on close inspection under direct light. A minor blemish which I only mention for the sake of the discerning collector. That’s about enough on construction and appearances, what about the puzzle? Here’s where things get interesting. EF 03 and EF 04 have completely different mechanisms. Both are interesting, but I must tell you right away that the EF 03 is a relatively simple variation on the EF 02. If you are mostly interested in puzzling experience, I don’t see the need to get both puzzles. They are simply too similar. I don’t think telling you this is a spoiler. If you’ve solved EF 02 and then you move to EF 03, are you not going to try the thing that worked before, just to check it off the list? Of course you are. It won’t work. But with moderate effort, you will find how it does. If you are a purist, you will find the variation to be inelegant. I should also say that even though EF 03 is a slightly more complex mechanism, requiring an additional step, I am not certain that this makes it more difficult. You really have to do them both to understand why; it’s in the subtleties of the construction. Suffice it to say that there is reason to believe EF 02 could be an equal or superior challenge to EF 03, despite (or thanks to) its simpler form. Along this same line of thought, if you solve EF 03 first, there will be no point in doing EF 02 from a puzzling perspective. You must solve them in proper order if you intend to do both. Having done them both, my personal preference is for EF 02. In defense of EF 03, however, it was intended as an IPP exchange puzzle and I imagine it suited that purpose admirably. EF 04 presents a completely different mechanism altogether. And that fact brings us to what I believe is the higher-order utility of the overall EF 03/04 design. This puzzle design is quite simply an excellent generic platform for mechanism implementations (Ed: that sentence is quite a mouthful! ), and I suspect it might have been developed with this in mind. This new larger Euro Falle is attractive, durable, and also has a generous internal space. One can only imagine the kinds of mechanisms that could be stuffed in there. One could imagine a line of guest designers using the basic platform and spinning off more in the series. Would that not be fun? Back to the EF 04.... There is actually not much I can divulge about it, to be honest. You will simply have to try it. As mentioned in the EF 02 post, these are basic coin release puzzles and you will likely solve them with only moderate effort. I found the EF 04 to be worthwhile. It probably took me around 15 minutes which, for a (non-blind maze) coin release, is about what a moderately experienced puzzler should expect on average. That’s fair for the type, I think. Anything more is exceptional and anything less is a little disappointing. But there is much variation. I am speaking in generalities and subjectivities of course. Jeff took a bit longer to solve it, and he is no slouch, so there is a reasonable chance you will get extended play time with EF 04. Before I get to the concluding section on value and ultimate recommendations, I feel obligated to mention one construction issue with my particular EF 04. I hope this is just an idiosyncratic problem. If there were a bad one in the batch, I am very sure it would find its way to me. When I was picking up EF 04 to bring it to my office, where I do my writing, one of the pins/screws fell completely off the puzzle. I was shocked, as I had been handling it for quite a while with not even the hint of an issue. With my other puzzles held by such pins (in the Reiche/Constantin style), I keep any eye on them and expect to occasionally tweak them. But these pins are not part of a movement and thus are very snug, or so I thought. Checking both EF 03 and EF 04, all the others seem tight. But the problem is not really that the screw was loose and unscrewed itself, it’s that I can’t screw it back in! The screw does not reach the pin when inserted in its hole. This leads me to believe that the screw was just barely holding on by its last thread. It seems clear that either the screw or the pin should be longer. Maybe there was enough compression of the wood when it was assembled for it to screw in, but not now. It occurred to me that maybe the wood had swelled a little - I am in the sub-tropics after all - but this would be minimal, and in any case, to use a pin/screw with such little leeway is just a mistake. So I’ll be going to the hardware store to get the right part in the near future. Once again, I hope this is a fluke. And I really hope that it is just the one bad pin. I’ve never had such a problem with any other Siebenstein-Spiele puzzle, so I don’t want this to be taken as an indictment of the shop’s work quality. It is known to be excellent. Cannot be rescrewed - is this a general fault or just Mike's? Final thoughts: I believe 35 CAD (puzzlemaster price) is quite fair for these puzzles given their quality (the pin issue notwithstanding). 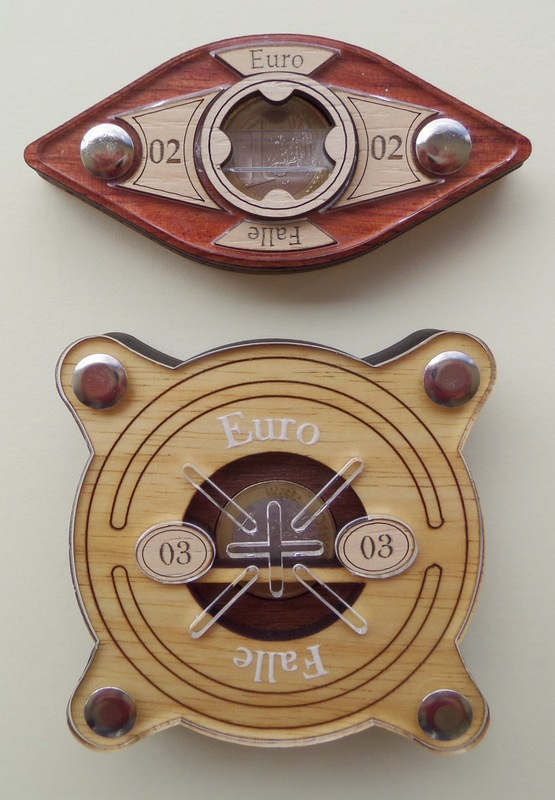 The Euro Falle puzzles are all fine items, but as I mentioned, you don’t need them all if you are looking for diverse mechanisms. Likewise, if you want a really hard challenge, then these are not for you either. But they are also not trivial and have the potential to stump you for a little while. For the collector, I would say that it is not a question of whether to buy them but rather when to fit them into your purchase schedule (Ed: I'm in serious trouble already with my puzzle purchasing! Just see my New Additions page for details). When I first drafted this review, all of the EFs were available at Puzzle Master (and elsewhere). In the time it has taken me to finish it and Kevin to post it, Puzzle Master is out of stock of EF 04. So you might want to make your move sooner rather than later. Despite any negatives I have written, I am a proud owner, and once I get that damn pin back in, the Euro Falle family will take their rightful place on the puzzle shelf. Did I mention that they display well? Well… they do. Thank you Mike - another beautifully written and illustrated blog post for me! I really appreciate your efforts - I had to work yesterday in the emergency operating theatres all day and so missed both the MPP and a day at home doing all the normal weekend chores. Having your post ready to go has really helped me keep the present (first) wife happy by having time to do stuff for her as well as post my customary Sunday afternoon blog post. If any others would like to write a review then contact me and if it is suitable and well written enough then I am happy to post it on my little piece of the net. That was a wonderful, information-packed article. I learned something new about PuzzleMaster.ca and I am reminded that I should probably patronize them more often. I'm quite sold on these wood mechanical puzzles. As for the pin, I wonder if there was supposed to be some adhesive and that one got missed? I'm interested to know the eventual resolution. Pete - Puzzle Master is perfect for you because the postage within Canada is so much cheaper than international. They do have a VERY good selection of twisty puzzles too. These screws never have adhesive - they are common to many of these laser cut wooden puzzles and they can always freely unscrew. I suspect that these ones are just so thick that the standard screw only just reaches. I'm glad you like Mike's article - he put a lot of time and effort into it and it definitely shows. I enjoyed editing it too! Hi Pete, they are indeed a top notch shop and new stuff crops up every week. I'm still working through their many great entanglements. If I was in CA, I'd have a lot more by now. Kevin isn't kidding about the international postage. I'll give an update on the screw fix, when it happens. Looks like those little pins are not as easily available as i thought. Mike, fantastic article once again. Very informative and thoughtful about the puzzles. I noted some pin issues with my copy as well but not as pronounced as yours. Thanks Box, I appreciate that. Pin was a real shocker. Luckily the puzzle is so sturdy, it would probable hold just fine with only two pins. Mike, again, another very well written and comprehensive review of both the 03 and 04. Your article is superb for those yet to decide which one puzzle to buy. Great job! That's a little unkind! You don't have to read the articles on my site. I pretty much always publish long-winded accounts and aim to be informative and humorous. It's not just a puzzle review for me (and most of my readers), it's entertainment. I love Mike's reviews and am very grateful for them! My apologies. I do enjoy your reviews but I guess I was looking for the cliff notes.....must have been a long day. Great puzzles though, all 3. The EF5 will be out soon and I promise to read and enjoy your review. Cast Mobius - Mike Weaves His Magic Again! How complex can a packing puzzle be?